Vintage - Paragon Fine Bone China, Pattern #657, Trio Tea Setting, Made from 1960 thru 1963 Only - Three (3) Piece Setting. This Beautiful Paragon Fine Bone China, Made in England in the Pattern #657, was only made for (4) years. 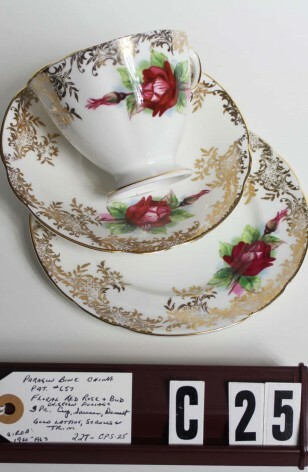 A great looking Trio Tea Setting, consisting of Cup, Saucer, and Dessert Plate. The Pattern is a Beautiful Deep Red Rose and Rose Bud, Green and Pink Leaves on a really White Background. Has gorgeous 22kt Gold Filigree of Scrolls, Lattice and Leaves on Lip. 22kt Gold Trim on the Rims and on both the Cup Foot and Handle, Great condition. This Beautiful Paragon Fine Bone China, Made in England in the Pattern #657, was only made for (4) years. A great looking Trio Tea Setting, consisting of Cup, Saucer, and Dessert Plate. The Pattern is a Beautiful Deep Red Rose and Rose Bud, Green and Pink Leaves on a really White Background. Has gorgeous 22kt Gold Filigree of Scrolls, Lattice and Leaves on Lip. 22kt Gold Trim on the Rims and on both the Cup Foot and Handle, Very Good Resale Condition unless noted below or in pictures..
1 - Dessert/Bread/Tea Plate - 6 1/4"